Stand firm therefore - this is the third time Paul calls on believers to stand firm (see notes Ephesians 6:11; 6:13) thus emphasizing the need for immovable steadfastness in the face of a relentless, ruthless foe. Stand firm (2476) (histemi) means literally to support oneself on the feet in an erect position. It means to take up or maintain a specified position or posture. In context it conveys the idea of digging in (the Roman sandals had spikes for this purpose). From a practical standpoint one stands firm by living the obedient, Scripture–dominated, Spirit–empowered life - the Spirit in such a state is not quenched or grieved and strengthens the obedient believer to stand firm. The greatest weapon we have in warfare is not what we say to the devil but how we live the ''Christ life''. Obey, surrender, submit for this is your greatest weapon. It's not binding but it's bowing, saying ''yes'' to Jesus and committing to do His Word...at the moment He says it...then at that moment you become a fortress against the devil. Again Paul like a military general barks out a command to the troops of saints to stand firm. The aorist imperative conveys a sense of urgency. Do it now! Don't delay! The active voice means that we must make the choice to stand firm. God gives us the want to and the enablement but He won't force us to choose to stand. Using the metaphor of a battle, in the military sense to stand firm meant to hold a watch post or to stand and hold a critical position on a battlefield while under attack! The intent of Paul's exhortation is not unlike that of our Lord to the embattled church at Thyatira, whom He commanded, “hold fast (aorist imperative) until I come” (Re 2:25-note). The believer needs to be strengthened in the inner man, letting our mind be affected by the truth, and letting the Spirit of Christ motivate us (Ezekiel 36:27, Php 2:12-note) and live His life through you. Stand firm by being in His word, obeying His word, repenting quickly and returning to your first Love. If you are disobedient you are deceived and a deceived person doesn't even know it! Furthermore when you are deceived you are primed for defeat! That is how good the Deceiver is. Remember his territory is the darkness, this present evil world system, and even though believers have been transferred out of darkness and into God's marvelous light, we can still choose to place ourselves under his domain of darkness when we willingly disobey God's Word. Therefore (3767) (oun) introduces a logical result or inference from what precedes. Whenever you encounter a term of conclusion, pause to ponder what is the writer concluding? The items of armor appear in the order in which a soldier would put them on and together make up the full armor (panoplia) every soldier had put on before taking the field in mortal combat. Having girded (4024) (perizonnumi from perí = about or around + zonnumi = gird, gird around especially with a belt) means to gird all around as preparation for work or activity. Figuratively, perizonnumi speaks of readiness for activity while ungirding denotes rest. This picture derives from the custom of shortening the long flowing garments of Orientals which were pulled up and knotted at the waist for freedom of movement. The idea is to tuck up one’s long garment by pulling it through a belt. From the belt hung the scabbard in which the soldier's sword was sheathed. The belt tied tightly around the waist indicated that a soldier was ready for combat. Conversely, to slacken the belt equated with the soldier going off duty, something that is never to be in a Christian soldier. We are always on duty, for our foe never rests. In the middle voice perizonnumi means you yourself have to fasten on the belt, wrapping yourself around. No one can accomplish this girding for you. Salmond notes that "The soldier might be furnished with every other part of his equipment, and yet, wanting the girdle, would neither be fully accoutered nor securely armed. His belt...was no mere adornment of the soldier, but an essential part of his equipment...it was of especial use in keeping other parts in place, and in securing the proper soldierly attitude and freedom of movement." Exodus 12:11 'Now you shall eat it in this manner: with your loins girded (LXX = perizonnumi), your sandals on your feet, and your staff in your hand; and you shall eat it in haste-- it is the LORD's Passover. Psalm 18:32 The God who girds me with strength, And makes my way blameless?..39 For Thou hast girded me with strength for battle; Thou hast subdued under me those who rose up against me. Jeremiah 1:17 "Now, gird up your loins, and arise, and speak to them all which I command you. Do not be dismayed before them, lest I dismay you before them. Luke 12:35 "Be dressed in readiness, and keep your lamps alight. Luke 17:8 "But will he not say to him, 'Prepare something for me to eat, and properly clothe yourself and serve me until I have eaten and drunk; and afterward you will eat and drink'? Rev 1:13 and in the middle of the lampstands one like a son of man, clothed in a robe reaching to the feet, and girded across His breast with a golden girdle. Rev 15:6 and the seven angels who had the seven plagues came out of the temple, clothed in linen, clean and bright, and girded around their breasts with golden girdles. Roman Soldier's Belt (click figure to enlarge) or cingulum militare (soldier's belt) was not the most noticeable piece of the armor but was a soldier's badge of office, worn with the tunic at all times and formed the central piece of his armor holding all the rest securely in place. The belt was broad and composed of sturdy leather. From it hung an overlapping skirt of leather straps almost like an apron on which were decorative rivets. Also from the belt hung specialized hooks and holders on which to secure the scabbard that contained the dagger ("pugio"), the quiver which held lances, and an apparatus on which to rest the large battle shield. 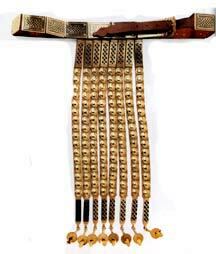 Also, on the belt were clips with which to hold the breastplate in its proper place. Supplies of bread, oil and water were also on the belt. Loins (3751) (osphus) (see additional note) or "hip" (as used in classic Greek according to the TDNT) refers literally to the general area of the body between the ribs and the thighs, the midsection between the upper and lower body that includes the hips, the small of the back, the waist, and the reproductive organs. Osphus refers to the lower region of the back, which is the region of the 5 lower vertebrae of lumbar region, the part of body where the girdle was worn. It is the region of the hips as opposed to shoulders and thighs. Jews considered osphus as the place of the reproductive organs and so we find the phrases ''to go forth from someone's loins'' equated with ''to be descendant''. Finally, In the NT girded loins signified that a man was ready for service or heavy battle. Osphus was used figuratively to describe a state of alertness or readiness. Girding the loins was a symbolic way of saying that one was standing firm or exercising self-control. The picture derived from the fact that Orientals would often tuck their long flowing robes in their belt around their loins , with a view to greater mobility for work, for travel, for battle etc. Thus girded one would thus be enabled to move unimpeded and be less likely to be hindered or tripped. As Warren Wiersbe put it "God’s promises are prods, not pillows!" Nahum 2:1 The one who scatters has come up against you. Man the fortress, watch the road; Strengthen your back, (LXX = osphus) summon all your strength. Matthew 3:4 Now John himself had a garment of camel's hair, and a leather belt about his waist; and his food was locusts and wild honey. Hebrews 7:5 And those indeed of the sons of Levi who receive the priest's office have commandment in the Law to collect a tenth from the people, that is, from their brethren, although these are descended (come out of the loins) from Abraham...10 for he (Levi) was still in the loins (osphus) of his father when Melchizedek met him. These thoughts harbored in the mind prevent the Holy Spirit from using the mental faculties of the Christian in the most efficient manner, and thus from causing that believer to grow in the Christian life and make progress in his salvation. The word “to gird up” (1Pe 1:13-note) is in the aorist tense which refers to a past once-for-all act. Peter treats this as a God-expected obligation on the part of the believer. In 1Pe 1:3 (see note) we learned that as the believer definitely subjected himself to the ministry of the Holy Spirit, He (the Spirit) would produce in his (the yielded believer's) life through the Word, that Christian optimism that always looks for the best and not for the worst, that always sees the silver lining on every cloud. Truth (225) (aletheia from alethes = true in turn from a + lêthô = that which is hidden or lanthanô = conceal, this combination meaning out in the open, containing nothing that is hidden) describes the body of reality (facts, events, etc) or the content which is true, or which is in accordance to what actually occurred. Truth is the unveiled reality lying at the basis of and agreeing with an appearance; the manifested, the veritable essence of matter. Truth is the correspondence between a reality and a declaration which professes to set it forth. Words are true when they correspond with objective reality. Persons and things are true when they correspond with their profession. Hence a truth is a declaration which has corresponding reality, or a reality which is correctly set forth. Since God is Himself the great reality, that which correctly sets forth His nature is pre-eminently the Truth. Obviously whatever God says is "the truth", and in fact "the Truth" is actually embodied in the Person of Christ Jesus! We must faithfully hold the truth of God’s word, but it is also necessary for the truth to hold us. We must apply it to our daily lives and test everything by comparing it to the plumbline of God's Word of truth. The state of the heart answering to God’s truth; inward, practical acknowledgment of the truth as it is in Him: the agreement of our convictions with God’s revelation. Two battleships assigned to the training squadron had been at sea on maneuvers in heavy weather for several days. I was serving on the lead battleship and was on watch on the bridge as night fell. The visibility was poor with patchy fog, so the captain remained on the bridge keeping an eye on all activities. Shortly after dark, the lookout on the wing of the bridge reported, "Light, bearing on the starboard bow." "Is it steady or moving astern?" the captain called out. Lookout replied, "Steady, captain," which meant we were on a dangerous collision course with that ship. The captain then called to the signalman, "Signal that ship: We are on a collision course, advise you change course 20 degrees." Back came a signal, "Advisable for you to change course 20 degrees." The captain said, "Send, I'm a captain, change course 20 degrees." "I'm a petty officer second class," came the reply. "You had better change course 20 degrees." By that time, the captain was furious. He spat out, "Send, I'm a battleship. Change course 20 degrees." Back came the flashing light, "I'm a lighthouse." We changed course. Comment: Truth is the gospel. Truth is what saved us. Truth has to be believed to be effective in our lives. So, when we have our loins girded about with the belt of truth, part of it refers to the gospel of the Lord Jesus Christ, by which we were saved and are now daily sanctified). Ephesians 4:24 (note) and put on the new self, which in the likeness of God has been created in righteousness and holiness of the truth. Ephesians 4:25 (note) Therefore, laying aside falsehood, SPEAK TRUTH, EACH ONE of you, WITH HIS NEIGHBOR, for we are members of one another. We then are to gird our loins with the belt of truth which is pure, which has no deception but instead accurately manifests some hidden reality. To be clothed with truth means to be sincerely committed to truth. In other words, I am totally sold out to who God is. I am totally sold out to what God has done. I am totally sold out to what God has said. I am yielded to Him. It is the truth, and I am now completely surrendered to Him. "HAVING GIRDED YOUR LOINS WITH TRUTH" is an aorist middle participle (having girded) which means I can’t put it on for you. A lot of people come to church, and they feel like when they walk in the door, everybody is just going to love Jesus. The problem is, you can preach the truth but an individual has to make up his own mind as to whether or not to adhere to that truth. I can’t make it happen. It is a choice that we make, constantly choosing to be affected, to be totally committed to that which God says, to what He is, and that which He has done (these are all "truth"). To be girded with truth means that I am sincerely, totally, wholly committed to truth which most obviously is found in God’s Word. Paul is saying "Having girded your loins with truth, you must choose to allow truth to influence your life." Why is this girding with truth a piece of the armor and why is it so important in warfare? We live in a darkened, deceptive world. The devil is constantly deceiving the whole world. Now believers have been made light in the midst of that darkness (see note Ephesians 5:8). If we are going to stand firm and wear the garment, part of that garment has a thread and it is armored. That armored thread is that we be totally committed to truth, who God is, what God has said and what God has done. "Loins" refers to the lower back and Paul's analogy is beautiful. Your lower back is what helps you to stand. If you have trouble in your lower back, you are going to start bending and falling. Years ago I bought a little car to save gas. One day I came to the church, got out of the car and when I did, I swung my body the wrong way. Something went out in my lower back and I fell on my hands and knees and could not get up. I could not stand. Something happened in my lower back that brought me down. The word osphus refers to the five lower vertebra of the back. The Apostle Paul is describing a Roman soldier who wore wide belts that carried their weapons. But also the belt would protect the lower back. When they went into combat, they were hand to hand, constantly digging in and standing up. Something had to gird and strengthen them. Paul says, "You are in a dark world. You are in a deceived world. When you get up on Monday morning and walk out you face it." Even on Sundays folks, we face it in the church. It is all around us. People who are not surrendered to Jesus Christ and to His Word don’t understand how sincerely wrong they can be because the mind is the key. Someone asked me, "Do you mean if you don’t wear that belt, the whole garment falls off?" I am not sure we can biblically say that, but that is good to remember. If you don’t have the belt of truth on, forget the rest of the armor. Truth means I am totally sold out, loving who God is, what God has said. I am not going to listen to what the world says. I am going to listen to what God says. Now this is an armored thread in that garment. It protects me because the one thing the devil wants to do is to deceive me. What we don’t understand is, if we are not putting the Word of God into our minds, balancing out the error and deception we are being pounded with every day, we are already being misled and don’t know it. Listen, just because you think it doesn’t make it right. Examine it. Look at what God says. Folks, we are living in an upside down world and only the Word can put it right side up. Now Paul is not specifically talking about just the Word. There is no definite article. But he is talking about truth and its essence—who God is, what God has done, what God has said. It is all wrapped up in that. Friend, if I am not going to be surrendered, if I am going to do stupid things, fill my mind with things of the world, then what happens next is my own fault. I wake up with a negative, critical and discouraged feeling that simply overwhelms me. Have you ever done that? I walk around thinking, "What is wrong?" What happens is, you start being suspicious. You start being critical. You start being bitter. Why? This is where we live every day folks. The way you are thinking right now is determined by some standard in your life. If it is not the standard of truth, you have already lost your garment, you are already led astray and you don’t even know it. That is what Paul is saying. It is urgent. The Word has to be in your life. Folks, listen, they are telling us on the news that we are not going to have enough room for everybody in the world in a few years. I was watching CNN the other night and they said Social Security is going to go bankrupt. Who cares! God is not bankrupt! What does God say compared to what the world is saying? We talk about truth, and we will defend truth, but how many people are living in it? Folks, until you are adhering to truth, you have no strength. No wonder you have grown weak in the back. No wonder you are trying to cower down. No wonder you have been knocked down. Only truth can gird your loins and cause you to be able to stand. for twenty centuries, men and women in desperate need have called out, "Lord Jesus Christ! Help me!" And help comes! Deliverance comes! That is how we know that Jesus is the truth. Remember, all competing and conflicting systems and philosophies must be tested at all points, not at just one. Many philosophies can provide limited help and insight in this or that area. Even Karl Marx, as misguided as he was, had a few kernels of limited and fragmentary truth embedded in his godless diagnosis of human problems. But the presence of occasional partial insights and scattered nuggets of truth does not validate a system of ideas or beliefs. Truth is a complete entity. It is all or nothing. A half-truth is frequently no better than an outright lie and is sometimes even more deceptive than a lie. That is why witnesses in our courts must swear to tell "the truth, the whole truth, and nothing but the truth" because fragmentary truth produces deception. Truth is reality. Truth is the sum total of the way things really are. Therefore, truth is the explanation of all things. You know you have found the truth when you find something that is wide enough and deep enough and high enough to encompass all things. That is what Jesus Christ does. Further, ultimate reality never changes. Another mark of truth is that true truth never requires updating. It never needs to be modernized. If a moral or spiritual principle was true ten thousand years ago, it is still true today. If a principle is true today, it was true a hundred thousand years ago. A man once visited his old friend, a music teacher, and said to him in that casual way people have these days, "Hey, what's the good news today?" Without saying a word, the old man walked across the room, picked up a hammer, and struck a tuning fork. As the note sounded out through the room, he said, "That is 'A.' It is 'A' today, it was 'A' five thousand years ago and it will be 'A' ten thousand years from now. The soprano upstairs sings off-key, the tenor across the hall flats his high notes, and the piano downstairs is out of tune." He struck the note again and said, "That is 'A,' my friend, and that's the good news for today!" Play "My Hope is Built"
Having put on the breastplate of righteousness - When we first believed the Gospel we were justified (declared righteous) by faith which describes positional righteousness. What Paul is referring to in this passage is not so much our position of righteousness but our daily practice of righteousness, living rightly before God and man as we rely on the power of the Holy Spirit. “When a man is clothed in practical righteousness, he is impregnable. Put on (1746) (enduo from en = in + dúo = to sink, go in or under, to put on) means literally to clothe or dress someone and to put on as a garment, to cause to get into a garment (eg, Lk 15:22 where the father says "quickly bring out the best robe and put it on him..."). Aorist tense indicates this putting on is a past completed action and includes the idea that this action was decisive. In the middle voice (as in Col 3:10) it means to clothe oneself with something, in this case the "new man", who is clothed in the robes of Christ's righteousness and now needs to practice what this privileged position entails, i.e., to manifest His righteousness each day toward God and toward men in everyday life. Comment: Here the indirect middle conveys the sense "put on yourselves power from on high as a garment". They are to wait till this experience comes to them, which equates with “the promise of the Father.” Enduo used in this figurative in classical Greek by Aristophanes who writes "clothed with audacity"; Homer, "clothed with strength"; Plutarch, "clothed with nobility and wealth". Breastplate (2382) (thorax) describes either the chest area or part of the body covered by the breastplate or the protective covering of this area as utilized in combat. Polybius tells us that it was known as a heart-protector. Usually it was made of bronze but the more affluent officers wore a coat of chain mail. The front piece was strictly the breastplate, but a back piece was commonly worn as well. Comment: This prophecy is a picture of Messiah's second advent, at the end of the Great Tribulation, to save those who will be saved and to judge those who rejected His salvation. Had our Substitute not been fully, perfectly righteous, we could never have attained God's required righteousness. Instead Paul explains that believers have nothing to boast it for by God's "doing you are in Christ Jesus, who became to us wisdom from God, and righteousness and sanctification, and redemption" 1Cor 1:30. There are 10 uses of thorax in the Septuagint (LXX) (1 Sam. 17:5; 1 Ki. 22:34; 2 Chr. 18:33; 26:14; Neh. 4:16; Job 41:13, 26; Isa. 59:17; Jer. 46:4; Ezek. 38:4). Isaiah 59:17 And He put on righteousness like a breastplate (LXX = thorax), and a helmet of salvation on His head; and He put on garments of vengeance for clothing, and wrapped Himself with zeal as a mantle. Revelation 9:9 And they had breastplates like breastplates of iron; and the sound of their wings was like the sound of chariots, of many horses rushing to battle. Righteousness (1343) (dikaiosune from dikaios = just, righteous = root idea of conforming to a standard or norm) is derived from a root word that means “straightness.” It refers to a state that conforms to an authoritative standard or norm and so is in keeping with what God is in His holy character. Righteousness is a moral concept. God’s character is the definition and source of all righteousness. God is totally righteous because He is totally as He should be. The righteousness of human beings is defined in terms of God’s. Righteousness in Biblical terms describes the righteousness acceptable to God and thus which is in keeping with what God is in His holy character. Rightness means to be as something or someone should be. 2Cor 5:21 He made Him who knew no sin to be sin on our behalf, that we might become the righteousness of God in Him. Romans 1:17 (note) For in it (the Gospel) the righteousness of God is revealed from faith to faith; as it is written, "BUT THE RIGHTEOUS man SHALL LIVE BY FAITH." Comment: Peter says believers are now a "holy priesthood" [1Pe 2:5-note] and a "royal priesthood" [1Pe 2:9-note] -- how much more important for us to be clothed with righteousness! "Also righteousness will be the belt about His loins, and faithfulness the belt about His waist." Comment: Satan is the accuser, and his minions attack us by reminding us of our sins. It is important to make a distinction between imputed [justification] and imparted righteousness [sanctification]. When a sinner trusts Christ and is born again, the very righteousness of Christ is put to his account, and this never changes. As the believer walks with the Lord and yields to the Spirit, sanctification [present tense salvation - see related topic Three Tenses of Salvation] occurs and he becomes more like Christ. Because we know we have been accepted by God and are righteous in Jesus Christ [1Cor 1:30, 2Co 5:21]], we need not fear when Satan's workers throw their accusations at us. And although people are not our enemy, remember that Satan often uses people, even Christians, to slander and accuse us, but we are not called to fight back even though we are sorely tempted to do so. Christians, through one circumstance or another, often lack assurance. They feel unworthy before God. They feel they are a failure in the Christian life and that God is certain to reject them, and He is no longer interested in them. As Christians, we are constantly aware of our failures and shortcomings. Growth seems to take place so slowly. The first joy of faith has faded, and people often come to doubt God's presence with them, love for them, or forgiveness of their sin. There is a nagging sense of guilt. Their conscience needles them, making them feel unhappy and miserable. They feel God blames them. This is simply a satanic attack, a crafty and devilish accusation, a lie designed to undermine what God is doing in your life. piece of defensive armor covered the body, both front and back, from the neck to the thighs. It offered special protection for the heart. A warrior without his breastplate was dangerously exposed to the thrust of the enemy. than a walk in righteousness consistent with our position in Christ. Paul is not referring alone to that imputed positional righteousness which is the possession of all true believers, but the practical righteousness which results from the positional. It is the righteousness of both standing and state. That I may … be found in Him, not having mine own righteousness, which is of the law, but that which is through the faith of Christ, the righteousness which is of God by faith (Php 3:8-note, Php 3:9-note). yield (aorist imperative = command to do this now. Don't delay. It is urgent.) yourselves unto God, as those that are alive from the dead, and your members as instruments of righteousness unto God (Ro 6:13-note). If we are not living righteously we are easy targets for the enemy’s darts. in the day of adversity when Satan attacks. we should live soberly, righteously, and godly, in this present world (Titus 2:12-note). If we fall instead of stand when Satan attacks, it is because we have not been living right. Let every one with unconfessed sin in his life confess it here and now, lest the devil gain an advantage over any one of us. One who binds himself about with a determined loyalty to the holy will and law of God is secure against the deadly thrusts of the tempter. A man who is conscious of being in the wrong is usually a coward; a man who knows that he is right can withstand a multitude arid enters the conflict without fear. Righteousness is a matter of the heart continually; it is not something we piously and fraudulently parade one day a week. Strictest integrity must be maintained at all times, the heart being kept purged of every lustful desire and the mind clear of every unholy thought. Notice the words, “having on.” Christians are expected to be ethical and righteous. None but the righteous can stand. Righteousness is Jehovah’s breastplate (Is 59:17). What is righteousness? Righteousness is anything that conforms to a standard. Something is righteous if it conforms to a right standard. The world has its standard, and when people try to conform to that standard, they call it righteousness. It is deeds. It is what you do. In Isaiah God said our righteousness, conforming to the standard of man, is filthy rags in His eyes. So when you determine righteousness, you’ve got to find the standard. The standard is the truth and the truth is God. When you go back to the truth, then He determines the standard. When we start living lives, conforming to His rights over us and to His standards, then righteousness results. When we live righteously, conducting ourselves in conformity to the truth of who God is, what He has said, and what He has done, our righteous life becomes a breastplate which protects our heart as we stand in the spiritual war we live in each day. We represent the living Lord Jesus Christ. The way we honor who He is and what He says has to do with the motivation in our heart of never wanting to bring attention to ourselves, but only wanting to bring attention to Him. You see the new garment is Jesus being Jesus in our life. When I honor His truth, the armor against the devil is not me and does not draw attention to me. It is Jesus who draws attention to Him. Friend, if you want to frustrate the devil, put on the garment. Comment: Most of the translations and the commentators favor the former interpretation as discussed more below. Having shod (5265) (hupodeo from hupó = under + déo = to bind) means literally to bind under and thus means to bind under one's feet and so put on shoes or sandals. In order to stand firm the soldier must have have secure footing. Having shod is an aorist middle participle, which means do it on your own accord. You don’t need someone else to make you feel guilty if you are not doing it. Do it because Jesus is your Captain, your Lord, your Life. Do it because you have a high view of salvation. Do it because God says to do it in order that you not lack any piece of God's full armor. Paul uses the plural here so is speaking to the church as a whole, composed of Jew and Gentile. Remember that as a result of listening and receiving the word of truth, the gospel of their salvation, the Gentiles have been brought near and are now at peace with Jewish believers through the blood of Christ. So however one interprets this piece of spiritual armor, it is important to remember that the peace that the gospel established results in an army of individual believers who are united under one Head and are to march forward being diligent to preserve that unity in the bond of peace. If Satan can disrupt and divide the foundation of the the Christian army which was wrought by the gospel of peace, then he increases his chances of defeating us in individual battles. A common military practice of the Roman soldiers was to plant sticks in the ground which had been sharpened to a point, burying them just beneath the surface of the ground so that they could not be easily seen. This tactic was potentially debilitating to the enemy because, if the soldier’s foot was pierced, he could not walk and if he could not walk, he clearly could not fight. The thick soled sandals protected their feet from this catastrophe. The Greek middle is used again in the exhortation, “and having shod your feet“ the responsibility of the Christian soldier. If the Christian soldier is to stand up against the attack of the demons, he must see to it that his feet are properly protected and equipped. Mark 6:9 but to wear (KJV = shod with) sandals; and He added, "Do not put on two tunics." Acts 12:8 And the angel said to him, "Gird (zonnumi) yourself and put on (KJV = bind on) your sandals." And he did so. And he said^ to him, "Wrap your cloak around you and follow me." Feet (4228)(pous) refers to the foot, the terminal part of the vertebrate leg upon which an individual stands. The Roman soldier wore sandals called caliga, which were thickly studded sandals with cleats on the bottom of them. The cleats were to dig in and stand in the face of battle. Caliga was a heavy shoe studded with hobnails and worn by the ordinary roman soldier. Soldiers wearing the caliga -- i.e., the ordinary soldiers -- were known as caligati. Germanicus put the caliga on his young son when they were among the soldiers. As a result, he was named "little boots," and became the emperor Caligula. Many of higher rank wore the calceus. The iron hobnails hammered into the sole served three purposes: to reinforce the caligae , to provide the soldier with better traction, and to allow the soldier to inflict damage by kicking with it. Paul advises Christian converts to "put on the whole armor of God, that ye may be able to stand against the wiles of the devil" (Eph 6:11)...feet shod with the preparation [firm footing for the foundation] of the gospel of peace" This intimates the firm and solid knowledge of the gospel in which the believer may stand firm and unmoved like soldiers in their military duty. Preparation (2091) (hetoimasia from hetoimos = ready, prepared) means readiness, fitness for, alacrity or preparedness. Preparation in the active sense of making ready. A state of preparedness whether external or internal (Ps 10:17). Note that hetoimasia can also signify a prepared foundation or base, as frequently used in the in Septuagint (LXX) (see several representative uses below). Ezra 3:3 So they set up the altar on its foundation (hetoimasia), for they were terrified because of the peoples of the lands; and they offered burnt offerings on it to the LORD, burnt offerings morning and evening. Psalm 89:14 Righteousness and justice are the foundation (hetoimasia) of Thy throne; Lovingkindness and truth go before Thee. Zechariah 5:11 Then he said to me, "To build a temple for her in the land of Shinar; and when it is prepared (hetoimasia), she will be set there on her own pedestal." NIV "and with your feet fitted with the readiness that comes from the gospel of peace"
Williams "to put on your feet the preparation the good new of peace supplies"
As in the OT so among the Greeks, euaggelion was used for the proclamation of news of victory and the death or capture of the enemy! Ponder this in terms of our enemies!. Often the news was sent in a letter, but also came from the field of battle by ship, by horse, or a swift runner, who proclaims to the anxiously awaiting city the victory of the army, and the death or capture of the enemy. Others uses of euaggelion included being gladdened by the birth of a son, by news of an approaching wedding, or of the death of someone. The Cult of the Caesar was the state religion of the Roman empire, in which the emperor was worshipped as a god. When the announcement of the emperor’s birthday was made, or the accession of a new Caesar (gives rise to our English Kaiser & Czar!) proclaimed, the account of either event was designated by the word euaggelion or “good news.” The NT evangelists appropriated the word, take it out of the secular usage, and applying it to the message of salvation as the "best news" a man could ever hear! In the context of Paul's description of the Christian's armor his allusion to the gospel is not simply referring to how people get saved which is how some interpret this verse. Paul is reminding us to become strong in the faith and ready for battle by keeping our feet firmly planted in the truth of the Good News. We must have a solid grasp, a sure footing so to speak, in regard to what the Good News teaches, specifically that we can live daily in the victory of Christ's life (Col 3:4). Too many Christian's "feel" saved and yet experience no victory. Spurgeon - Rough roads grow smooth when these blessed gospel sandals are on your feet. A little stone in the shoe will make the pilgrim’s progress a very wearisome and painful one, so try to keep out all the stones, — everything about which you have any scruple, or that you think may be wrong; and walk in the safe and narrow way set forth in the gospel of peace. Peace (1515) (eirene from verb eiro = to join or bind together that which has been separated) literally pictures the binding or joining together again of that which had been separated or divided and thus setting at one again. Peace contrasts with strife and thus denotes the absence or end of strife. Why is it called the gospel of peace? Because of Adam's sin entering the world and affecting every man (Ro 5:12-note), all men are hostile toward God and at war with Him. It is only the gospel of Jesus Christ, the gospel of peace, which can bring about reconciliation of man to God and establishment peace. Therefore the gospel of peace pertains to the good news that, through Christ, believers are at peace with God and He is on their side (Ro 5:6-10). It is this confidence of divine support which allows the believer to stand firm -- he knows that he is at peace with God and God is his strength (see Ro 8:31, 37, 38, 39). In the dark days of England during the blitz, while bombs rained down on London and Coventry, the situation was truly desperate. Then Winston Churchill would come on the radio and speak to the English people when their hearts were filled with defeat and discouragement. At times they would be almost ready to quit. But that one man's voice would ring out and the nation would take heart again. The morale of an entire people would be elevated and strengthened. That is what Christ does. He speaks courage and peace to our hearts. Comment: Here the good news is the announcement of the captive exiles' return to Jerusalem from Babylon but Paul applies this verse to messengers of the gospel. Now those who have received the gospel of peace are at peace with God and the war is over because the peace treaty had been irrevocably "signed" in blood, the precious blood of the Lamb. Because of this unbreakable, immutable new covenant in His blood, believers can be at peace. Illustration of Peace - Jim Walton was translating the NT for the Muinane people of La Sabana in the jungles of Colombia. But he was having trouble with the word peace. During this time, Fernando, the village chief, was promised a 20-minute plane ride to a location that would have taken him 3 days to travel by walking. The plane was delayed in arriving at La Sabana, so Fernando departed on foot. When the plane finally came, a runner took off to bring Fernando back. But by the time he had returned, the plane had left. Fernando was livid because of the mix-up. He went to Jim and launched into an angry tirade. Fortunately, Walton had taped the chief's diatribe. When he later translated it, he discovered that the chief kept repeating the phrase, "I don't have one heart." Jim asked other villagers what having "one heart" meant, and he found that it was like saying, "There is nothing between you and the other person." That, Walton realized, was just what he needed to translate the word peace. To have peace with God means that there is nothing--no sin, no guilt, no condemnation--that separates us. And that peace with God is possible only through Christ (Ro 5:1-note). Do you have "one heart" with God today?